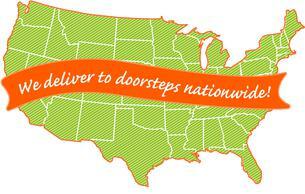 We can deliver to 100% of U.S. households and businesses including Alaska and Hawaii. *You can select a FUTURE DELIVERY date when going through the checkout. Ground Delivery - Your package will arrive in 3-7 business days (Monday thru Friday) (excludes Saturday and Sunday from calculated ship/delivery days) from the day you place your order. If you need your package to arrive later, you will be given an opportunity to select a suitable date during checkout. No Saturday, Sunday or Monday deliveries with this option due to the perishable nature of the product. 3-Day Select Delivery - Delivery by the end of the third business day. Delivers Tuesday through Fridays only. 2-Day Air Delivery - Your package will arrive in 2-3 business days. Delivers Tuesday through Saturday only. Orders placed after 9:00 a.m. on Thursday will arrive the following week. No Sunday or Monday deliveries with this option. Next-Day Air Delivery - Order by 9:00 a.m. (CST) weekdays and your package will arrive by the next business afternoon. Delivers Tuesday through Saturday. No Sunday or Monday deliveries with this option. Sorry, we cannot deliver to P.O. Boxes or A.P.O. or F.P.O. addresses. We'll gladly deliver to rural routes with complete addresses and telephone numbers. Due to import/export restrictions, we are unable to ship our products outside the United States, Canada, Puerto Rico and the U.S. Virgin Islands. Check your addresses carefully! Send a Meal reserves the right to make corrections and to limit refunds and replacements if an address error is made. * Address corrections after an order has been completed, may incur a $15.00 address correction fee. Our meals ship from various locations around the United States. All meals are delivered according to the shipping scheduled posted on this page.